A study into the claims made by left-wing group ‘Hope Not Hate‘ has found the organisation exaggerated “hate speech” claims by over 3000 per cent following the murder of Jo Cox MP. 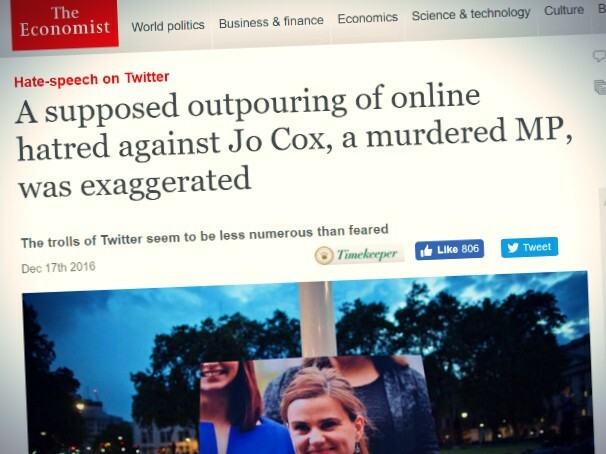 The Economist magazine investigated the claim by the group — led by left-wing political operative Nick Lowles — that 50,000 tweets were sent “celebrating” the murder of the MP or praising her killer. The investigation concluded: “Hope Not Hate misrepresented the findings of its own report when first releasing it to the press”, adding: “The report itself gave a confusing impression of the number of tweets that celebrated Ms Cox’s murder. We estimate that, in reality, of hundreds of thousands of tweets mentioning the MP by name, the number that celebrated her death was at most 1,500, and probably much lower”. The news mirrors the story of “anti-Islamophobia” group TellMAMA which lost government funding in 2013 for exaggerating the number of anti-Muslim attacks in Britain. Hope Not Hate has used TellMAMA as a source, even publishing opinion columns by its director Fiyaz Mughal. “Hope Not Hate admitted that its initial press release was incorrect and said that it was later changed. The charity referred us to the study’s authors, Imran Awan of Birmingham City University and Irene Zempi of Nottingham Trent University. Mr Awan agreed that newspaper headlines had oversimplified the study’s findings. Even so both authors retweeted articles repeating the press release’s false claim”. The authors of the report also refused to share their data with the Economist for the purpose of an investigation, claiming they had encountered death threats. Hope Not Hate also “misled” the British press, public, as well as politicians by claiming a “key theme” at the time was the calling of Thomas Mair — Jo Cox’s killer — a “hero”. But the Economist found: “In fact, many tweets containing the word “hero” were referring either to Ms Cox herself or to a pensioner who was injured while intervening to save her”. The Economist then measured a random sample of Brexit-related tweets in an attempt to find widespread “xenophobia” and has since declared: “Of these, we judged less than 1% to be xenophobic or worse”. Hope Not Hate has for years worked in collaboration with the left-wing Mirror newspaper and hard-left Searchlight magazine. Between the groups, they repeatedly target UK Independence Party figures including former leader Nigel Farage. The organisation — which is partly funded by the same Hawaii-based hedge fund manager who supports direct action groups like ‘Black Lives Matter’ — recently attacked reformist Muslims like Maajid Nawaz, Zuhdi Jasser, and Raquel Saraswati as “anti-Muslim”. In 2015, former Labour member and left-wing activist Anne Marie Waters denounced the group as being on the “extreme left”. The group also shares trustees with groups that campaigned against Britain leaving the European Union. The news comes as Brendan Cox, the widower of Jo Cox MP, hit out at Nigel Farage for claiming the Berlin attack was the responsibility of Germany’s leader Angela Merkel. Mr. Cox, who worked for former Prime Minister Gordon Brown — himself a major supporter of Hope Not Hate — set up a crowdfunding page named “Jo Cox’s Fund” shortly after his wife was murdered. The proceeds of the money raised were to be donated to the Royal Voluntary Service, Hope Not Hate, and the White Helmets in Syria.